Heat your oven to 475°F. 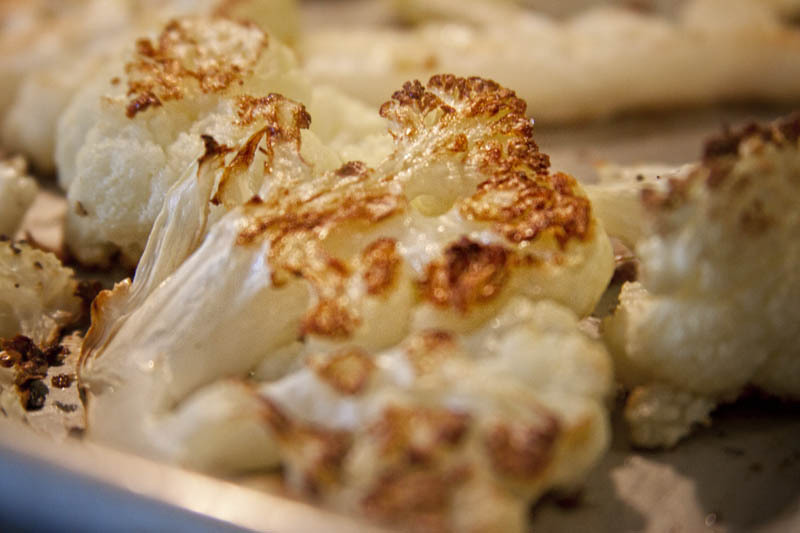 Place a rack in the top third of your oven or at least 4-6 inches from the broiler element. Salty: Once roasted, toss with some chopped capers, lemon zest and juice, and toasted seasoned breadcrumbs (I used crushed homemade croutons) and chopped fresh parsley. Indian: (If you have is drizzle with melted virgin coconut oil) With the salt and pepper toss with your favorite curry powder (mild or hot) or even garam masala and some fresh grated ginger, or dried. Once roasted finish with some lemon juice, chopped cilantro and some Greek style yogurt. Nuts and Fruit: Once roasted, toss with golden raisins, toasted pine nuts or almonds, a squeeze of lemon and chopped fresh parsley or chives. Spicy/Sweet: Once roasted, toss with some crushed red pepper or cayenne, and a little drizzle of honey, maybe even a squeeze of orange or lime juice. Bacon/Cheese: Once roasted, toss with some chopped cooked bacon and cheddar cheese, and finish with some chopped chives. I could go on and on…make up your own flavor combo!!! Preheat oven to 425 degrees. In a large bowl toss together the cauliflower, garlic cloves, shallots, and celery. Drizzle evenly with the olive oil. Spread evenly on a rimmed baking sheet. Roast in the oven until golden, about 30-35 minutes stirring halfway through the cooking time. In a 6-8 quart stock pot on medium high heat combine roasted vegetables, broth, water, thyme, bay leaf, and nutmeg. Bring to a boil then reduce heat to low and simmer stirring occasionally for 30 minutes or until all of the vegetables are very tender. Discard the bay leaf and thyme sprigs. Remove the pot from the heat. 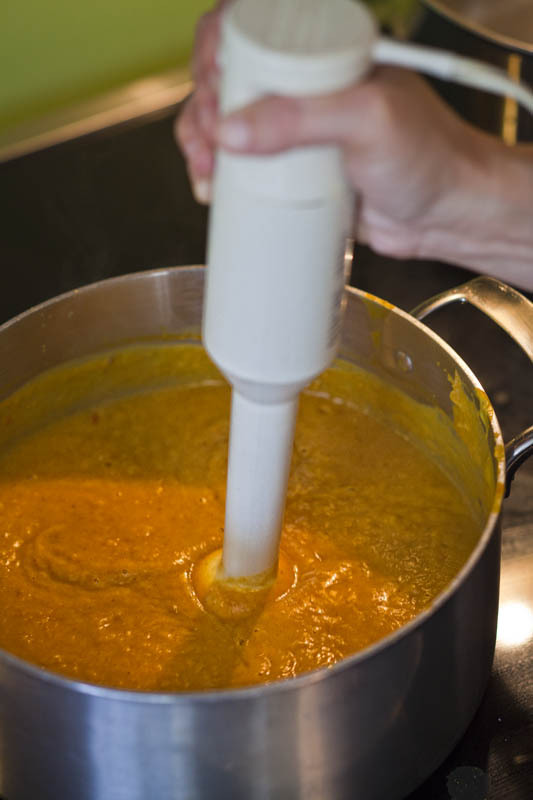 Blend the soup until smooth or to desired consistency with an emersion blender. Return the pot to the heat and add the cream, lemon zest and juice and allow to just heat through. Season with salt and pepper. Serve immediately with a drizzle of lemon olive oil and a sprinkle of fresh herbs. I use this in all kinds of applications especially in my kid’s food in order to get some extra nutrition into his food…I sneak it in everything, mac’n cheese, potatoes, quesadillas, pasta dishes, scrambled eggs, in quick breads(omit the pepper), in chicken salad, etc. 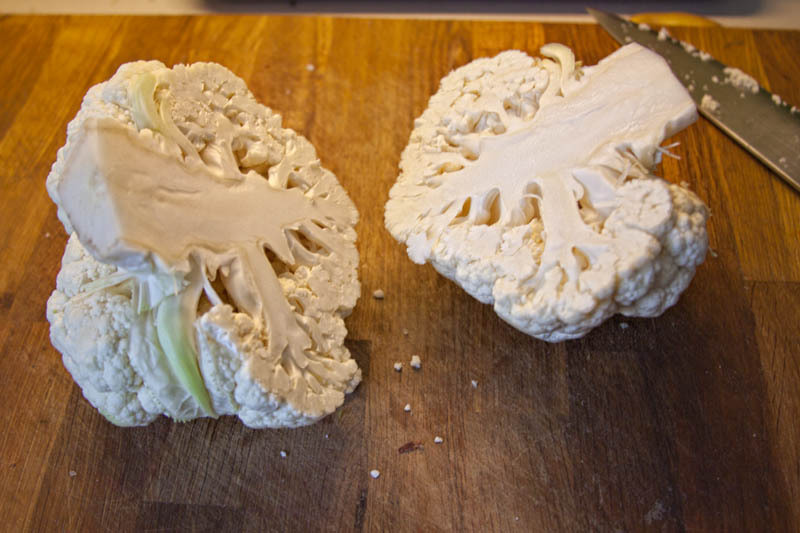 1 head of cauliflower, trimmed and cut into equal size florets. 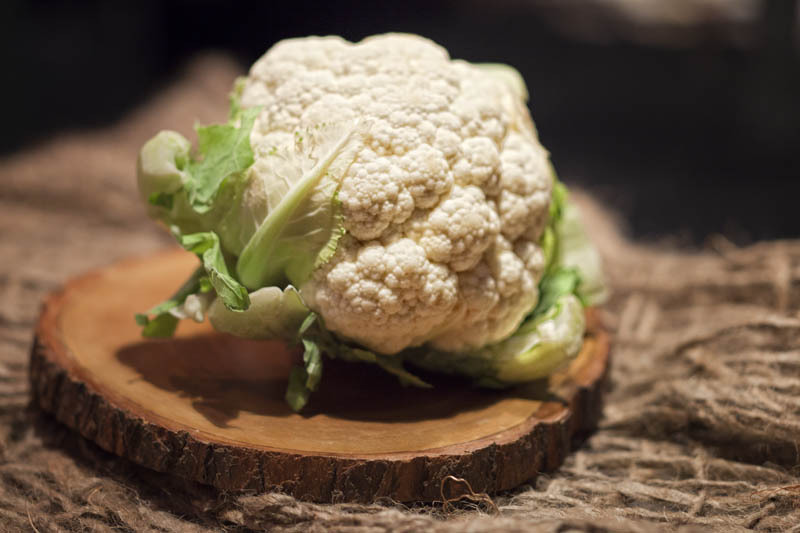 Steam the cauliflower in pot with a steamer basket and lid for about 10 minutes or until tender. 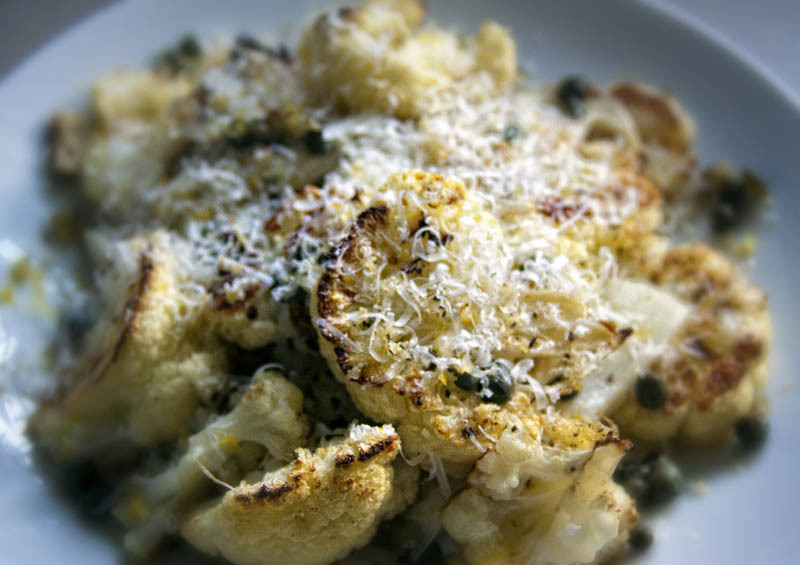 You can also cook the cauliflower in the microwave in a covered dish with some water in the bottom for about the same amount of time stopping to stir it half way through the cooking time. Puree the cauliflower in a food processor until smooth. Add butter, salt and pepper and eat as is or use it in combination with any of the suggestions above. Fall is upon us and I know this not just because of the weather but because I see pumpkins popping up everywhere. Tell tale sign that fall is here. Originating in the ancient Americas this member of the Curcurbitaceae family, which also includes, cucumbers, melons, and gourds is actually a fruit. It’s seeds, flowers, & leaves are edible as well as the fruit itself. It is 90% water and contains nutrients including lutein and both alpha and beta carotene, as well as dietary fiber. These gourds are grown all over the world and are part of many culture’s cuisines. The only continent that it isn’t crown on is Antarctica! Cultivated for human consumption as well as feed for livestock it is also grown for ornamental purposes. The Native American’s relied on it as a nutritious winter food source and the Pilgrim’s were said to make beer from it (surprise)! In the late 19th century Halloween was turned into a celebration with an emphasis on neighborhood activities and bringing the community together (I love this!!!) 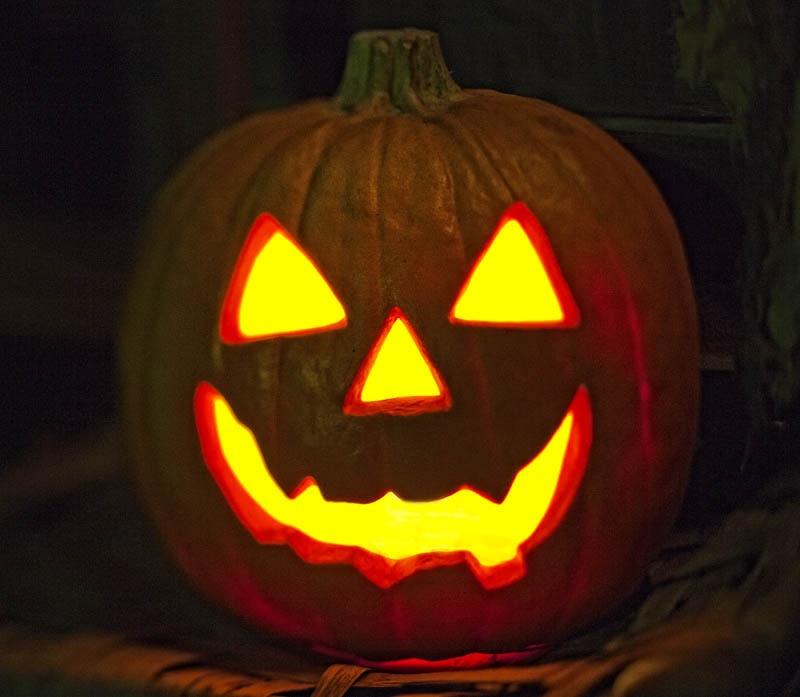 Activities included of course carving of the Jack O’ Lanterns which have a history in legend themselves, but in short are thought to ward of any evil spirits that might be roaming around. The largest pumpkin grown to date weighed over 1800 pounds! Pumpkins are extremely versatile in the kitchen as well. Literally any thing can be made with pumpkin, soup, vegetarian entrees, desserts, breakfast, lunch and dinner…you name it pumpkin can do it. 15-16 ounces pumpkin puree (make your own, see below or canned is fine) about 1 3/4 c.
Whisk together the flour through salt in a large mixing bowl. 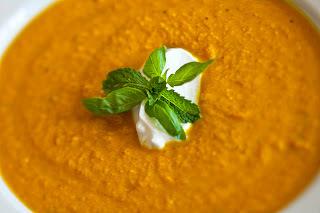 In a medium mixing bowl whisk together the pumpkin puree through yogurt. Add the wet ingredients to the dry and mix just until combined. Stir the raisins if you are using. 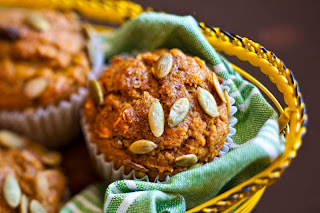 Using a disher scoop out the batter into a standard muffin tin top with brown sugar and pepitas if using. Bake on the middle rack for 20-25 minutes or until a toothpick inserted into a muffin comes out clean. 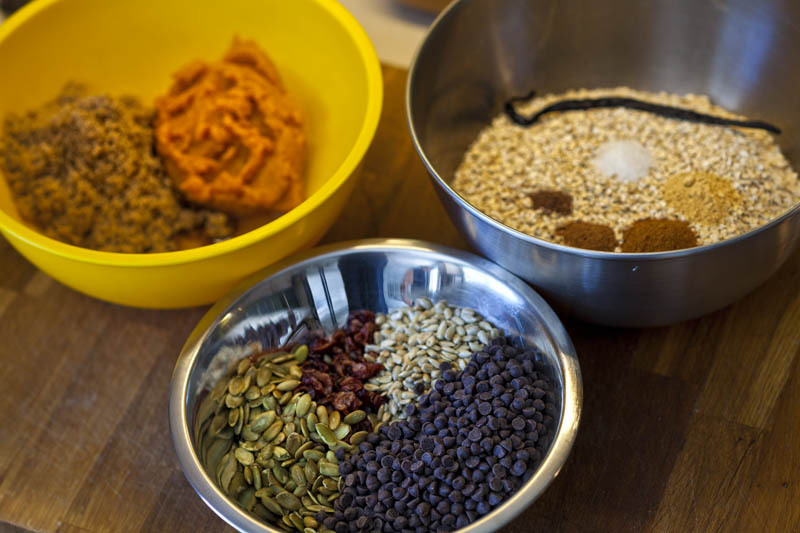 Pumpkin Puree: Cut a 5 pound pie pumpkin in half and scoop out the seeds. Place cut side down on a lined baking sheet and roast in a 400 degree oven for 45 minutes or until tender. Allow the pumpkin to cool then scoop the flesh and puree in a food processor until smooth. Can be frozen for later use. 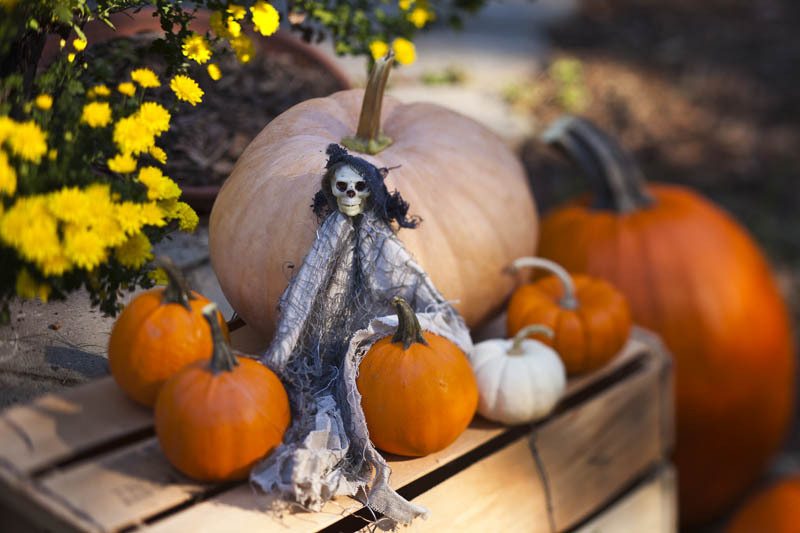 Pumpkin Fact: Pumpkins provide: protein, Vitamin A, Vitamin C, Potassium, Fiber, Iron, and complex carbohydrates. 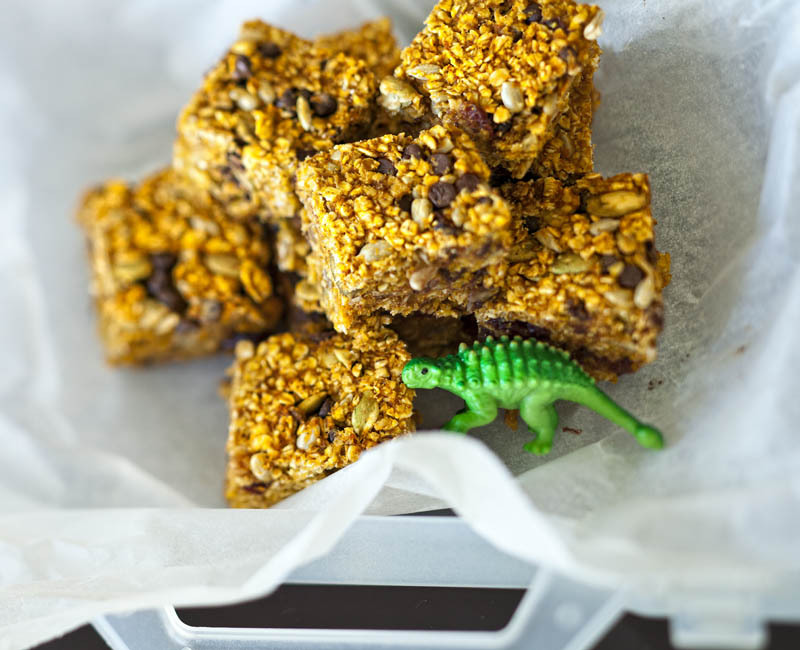 Oat Fact: Oats contain more soluble fiber than any other grain. Which means: it turns into a viscous gel and moves through the body more slowly making you feel fuller longer. “White whole wheat flour is milled from a white variety of wheat lacking the phenolic compounds that give traditional whole wheat its distinctive strong flavor. Think of it as an albino variety of wheat, with no genes for coloring the bran”. Heat the olive oil in a large pot on medium heat. Add the onions and a pinch of salt and cook until tender and beginning to brown, about 10 minutes. Add the garlic and cook 2 minutes more. Add the ginger and stir, then add all of the spices and allow them to cook until fragrant, about 1-2 minutes. Add the pumpkin, stock, coconut milk and chile if using and stir well to combine. Bring to a boil then reduce the heat and simmer for about 10 minutes. Add the fish sauce and cook for 5 minutes more. Puree with an immersion blender, add the lime juice and taste for seasoning. Serve with a dollop of Greek yogurt and a sprinkle of fresh herb mix. Heat an oven to 350° F. Butter an 8x8-inch baking pan and set aside. Whisk together the oats, spices, and salt. In another bowl, whisk together the brown sugar, pumpkin, honey, and vanilla extract until smooth. Pour over oats and stir well, until all of the oats are moist. Stir in the chocolate and rest of the goodies. Evenly press the mixture into the pan and bake for 30 minutes or until golden brown. Allow to cool completely before trying to cut. I store mine in the fridge but you can also freeze part of them if you wish. *** To toast seeds: put in a dry sauté pan over medium heat and cook tossing frequently until beginning to brown and become fragrant. Times will vary based on the size and amount. I get a CSA box (Community Supported Agriculture) every 2 weeks. It is one of my favorite things. I love getting packages as it is, even when I know they are coming. There is something exciting about getting a package delivered and ripping in to it. 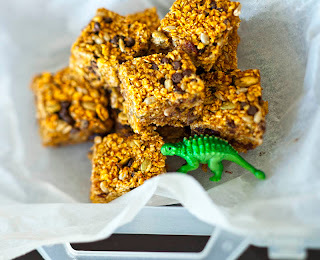 Although I know that I am getting my CSA box every other week and I get emails the Saturday before telling me what is coming my way that give me the opportunity to add on extra stuff like dairy or locally made granola, by the time I get it on Wednesday I have forgotten and it is like a fun food surprise every time. Also, part of the fun is food being delivered that I didn’t really choose to buy, as I would at the store, but the season has chosen for me, forcing me to be aware and creative with what nature is giving me. It is fun and challenging. 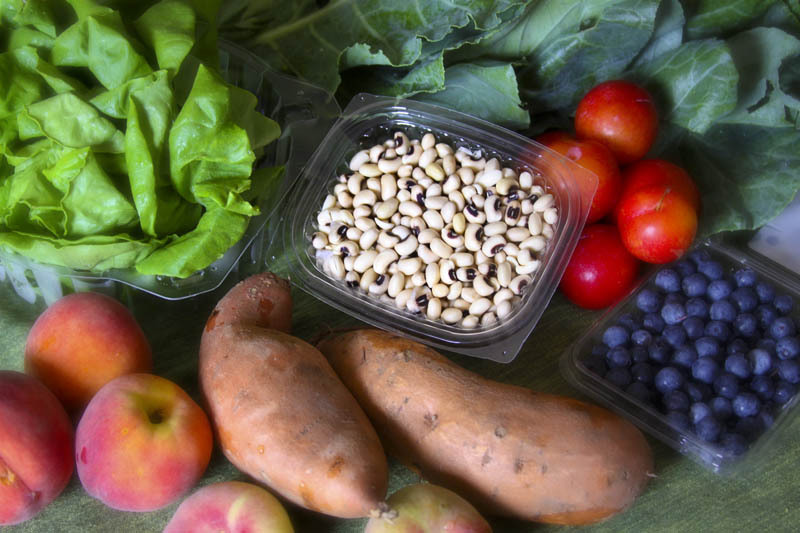 The CSA system is good on all kinds of levels for everyone involved. The farmers get financial support, you get crazy fresh seasonal, local produce and get to develop relationships by buying from the farmer directly and support local economy. It feels good to do good. Potatoes have held a presence for quite a few weeks now in my CSA boxes so I am trying to get creative with them. Although I have done all the usual suspects with the potatoes, baked, fries, mashed, gratin…I decided to take it a bit further. I crave good gnocchi and am always looking for different things to do with potatoes or ways to improve on some classics. Here are a few new ways to experience these incredible tubers. In a medium sauté pan heat the olive oil and butter over medium heat. Add the onions and cook until soft and beginning to brown around the edges, about 10-12 minutes then remove from the heat and allow to cool slightly. Step 2: While the potatoes are still warm send them through a ricer, food mill, or a fine mesh sieve. 1½ cups of the flour. Use part of the remaining flour to dust the counter and turn the dough out. Step 4: Knead until the dough is soft and smooth, avoiding over kneading and using more flour only of necessary to prevent sticking. Step 5: Divide the dough in half and roll into ropes about 12 inches long. Step 6: Then in half again and roll out into a rope about the thickness of your finger. Step 8: if you desire…I couldn’t really get the hang of this) by using a fork facing away from you, use your finger to press 1 gnocchi against the front of the fork tines pulling toward the handle to create shell like indentations…this is not necessary. Repeat with the rest of the dough. Step 9: Bring a large pot of well salted water to a boil. Cook the gnocchi in batches, about 2 handfuls at a time. Drop them in and once they float allow them to cook for an additional 15-20 seconds then remove from the water, repeat until all gnocchi is cooked. Serve with your favorite sauce or with some more butter and parmesan. 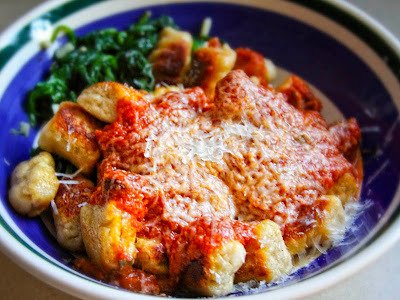 ***This step is not necessary but I like a little crunchy crust on my gnocchi or this is a good way to reheat them…I just heat some butter in a non-stick sauté pan and pan fry the gnocchi until golden brown and warm through…serve as you wish. Heat an oven to 425°F. 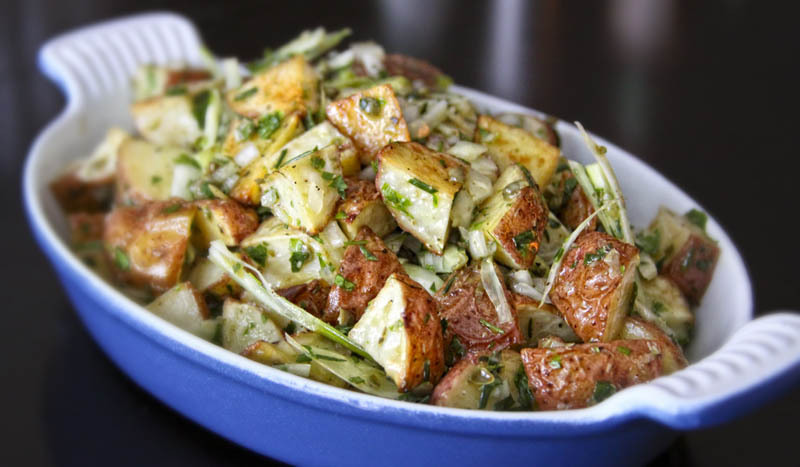 Toss the potatoes and onions with 2 tablespoons of the olive oil and season with salt and pepper. Spread the potato, onion mixture out on a sheet pan in a single layer and roast until tender and beginning to brown, about 15-20 minutes. While the potatoes and onions cook, brown the sausage in a sauté pan until fully cooked through, about 8-10 minutes. Heat a grill to medium high heat. Remove the dough from refrigeration and allow to come to room temperature. Toss the tomato quarters in 1 tablespoon of olive and season with salt and pepper. Place the tomatoes cut side down on the grill, turning after about 4 minutes and cook until soft, about 8-10 minutes total. Remove the tomatoes to a bowl and using kitchen shears cut into small pieces. Taste and season again with salt and pepper if necessary. On a floured surface, roll the dough out to about a ¼ inch thickness and about 12-inches by 14-inches across. Place the rolled dough on a floured pizza peel, or an inverted sheet pan. Brush with 1 tablespoon olive oil and carefully flip topside down onto grill. Close the lid and cook for 2-3 minutes. Using tongs, remove the dough to peel or pan, brush top side with remaining tablespoon of olive oil and flip. 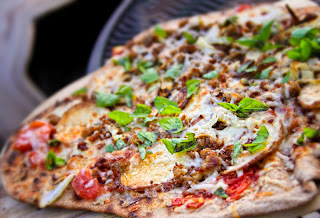 Immediately spread tomato sauce on dough, top with 1 cup of mozzarella cheese, potatoes, sausage, onions, then with other cup of mozzarella and parmesan. Close lid and cook until cheese is melted, a few minutes more. Remove from the grill and let rest a few minutes before cutting. Sprinkle with fresh basil. Cut and enjoy! Note: You can also do this in an oven. Chop the tomatoes and sauté on the stovetop until soft and then mash to make a sauce. Roll the dough out as above, top with ingredients then cook in a 350°F oven on an oiled sheet pan or pizza stone until the cheese is melted and the crust is golden brown, about 10-15 minutes. Heat an oven to 450°F. Place the potatoes on a sheet pan and toss with the 2 tablespoons of olive oil and season with salt and pepper. Roast until tender, about 20-25 minutes. Gently loosen the potatoes from the pan and set aside while you make the dressing. In a large bowl combine the ¼ olive oil, capers, vinegar, honey, parsley, chives, onion, and garlic. Add the potatoes (you can do this while they are still warm), and fennel if using and toss to coat. Serve warm or at room temperature. Eggplants are about out as far as being in season. These are wonderful vegetables (actually a fruit, technically a berry) that can be used in a variety of dishes and in many styles of cooking. 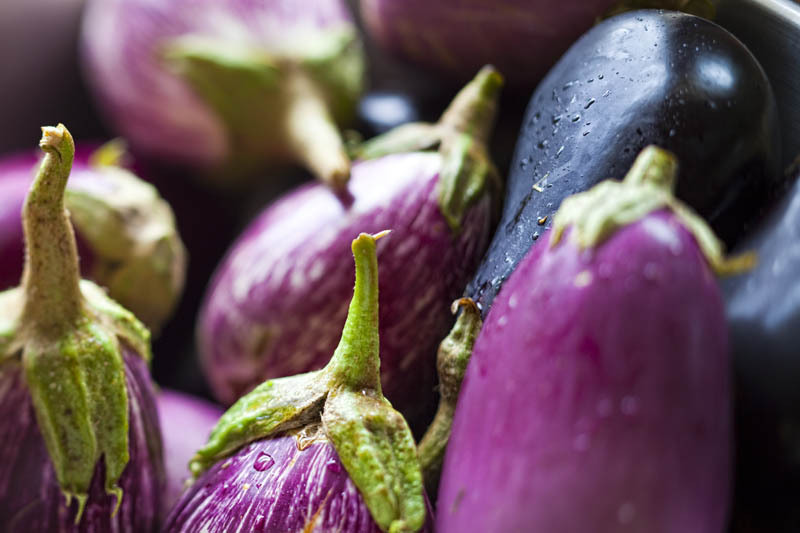 The eggplant is native to India and has been cultivated since prehistory. 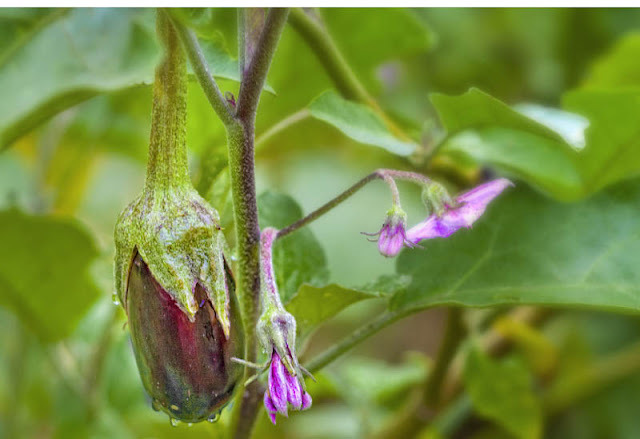 It is part of the nightshade family and like tomatoes was once considered extremely poisonous. When roasted they impart a very smoky flavor due to the fact that they contain trace amounts of nicotine (who knew?)! The eggplant can be bitter and larger varieties should be peeled before eating. Another trick to reduce the bitter quality is to salt the flesh and rinse before using. 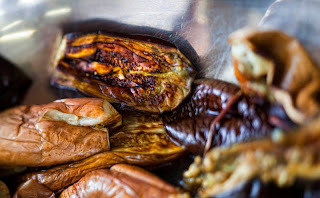 The eggplant comes in just about every shape and color and can be stewed, fried, roasted, grilled, sautéed, stuffed, baked, you name it and used in dishes ranging from dips to soups to vegetarian casseroles. Because of the texture of the flesh the eggplant is like a sponge and will absorb the flavors nicely of whatever it is paired with. Try a few of our recipes to enjoy this beautiful berry! Heat an oven to 450°F. drizzle the eggplant halves with olive oil and sprinkle with salt. 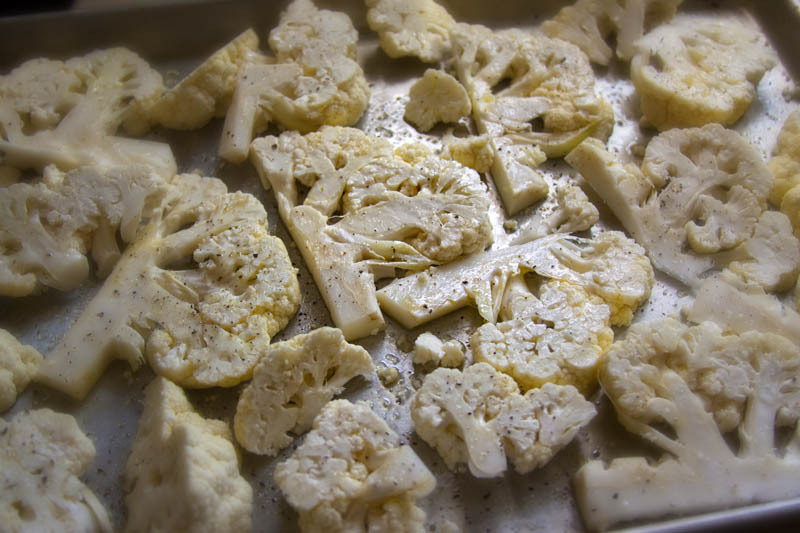 Place on a baking sheet and roast in the oven until squishy, about 20-30 minutes. Remove from the oven and allow to cool just until you can handle them. Scrape the flesh out of the skins and place in a food processor along with the rest of the ingredients through the smoked paprika. Process until smooth. Drizzle in half of the olive oil (2 tablespoons) and taste for seasoning. Add more salt if desired. To serve: place the eggplant mixture in a bowl and drizzle with remaining olive oil, top with more chopped parsley and a sprinkling of smoked paprika. 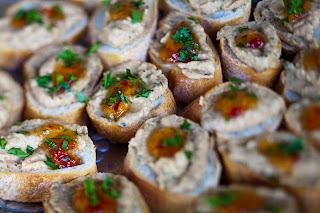 ***we served this as crostini at an event with a squeeze of Emily G’s Roasted Red Pepper Jam…YUM! Heat an oven to 425°F. 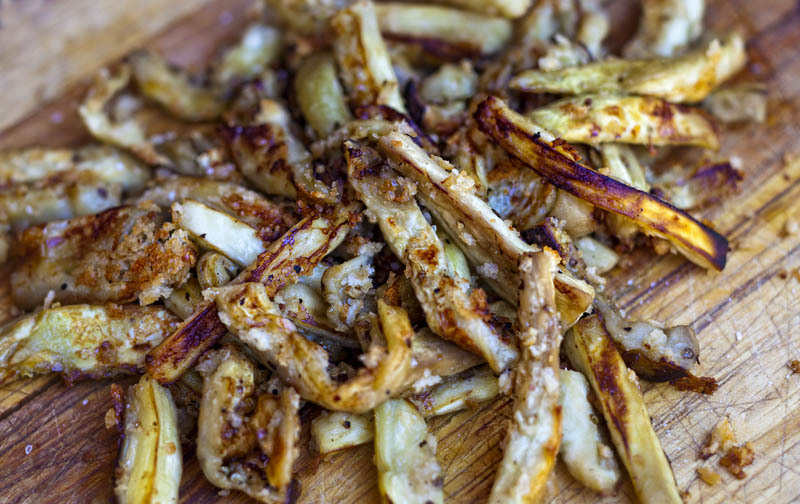 Toss the eggplant fries with the olive oil and salt and pepper. Then toss with the Parmesan and panko. Spread evenly on a baking sheet and cook for 10 minutes in the oven. Toss the fries and cook an additional 10-15 minutes or until they are golden and delicious. Serve, and enjoy. *** This recipe came to Ginger (my business partner) from a farmer at the Peachtree Road Farmer’s Market. When asked “What should I do with these?” this was their reply!